Yesterday Google announced that their flagship social networking site: Orkut will be retired. Announcing via blogs posts in English and Portuguese, Google said that effective September 30, 2014 Orkut would be “shut down”. From today onwards, no new Orkut account can be created and users can download their entire Orkut history using Google Takeout. – Since 2008, entire Orkut team was shifted to Belo Horizonte, Brazil considering that Orkut’s largest userbase was from Brazil. This is the reason Google announced the shutting down of this social network in English and Portuguese. The servers were still hosted in California, USA. – Orkut is named after a Google employee: Orkut Büyükkökten, who actually developed this social network. He is a Turkish software engineer, who utilized Google’s 20% Project time to create this social network. Google mandates all it’s employee to use 20% of their office time in developing their own projects. Orkut was the result of such a ‘side project’ by Orkut Büyükkökten. – When Orkut was launched, it was Marissa Mayer, the current Yahoo CEO who was the project manager who actually approved this project and named it “Orkut”. – In 2007, Mumbai police has asked the court to place a ban on Orkut as several hate groups had suddenly sprung all over the social network. The case is still pending. – Only three countries had the courage to block Orkut for their citizens: Iran, UAE and Saudi Arabia. They banned Orkut because lots of anti-national sentiments were shared across the social network. – In 2006, some hacking experts discovered a lethal virus which had spread it’s tentacles all across Orkut. Named as MW.Orc worm, it was launched when an ignorant user shared a jpg files which had this virus. Once installed in the System 32 folder of the user, this virus siphoned off private details such as passwords and bank account details. Social Media specialists are not actually shocked at this decision to retire Orkut, but are infact wondering what took Google so long to take this decision. Ever since Google+ was launched, speculations were high that Orkut would be retired very soon. The day has finally arrived. Time to have a last look at your ‘scraps’ and ‘orkut timeline’. RIP Orkut. 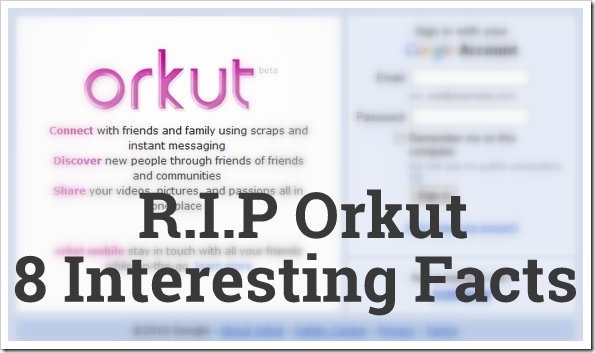 "RIP Orkut, Our Tribute Via 8 Interesting Facts About Orkut", 5 out of 5 based on 1 ratings. Do you have any source of Marrisa’s involvement in Orkut?